A Chinese bike-sharing company with operations in several major U.S. cities has decided that welcoming control by the Chinese Communist Party (CCP) would be its best bet for moving its business forward. 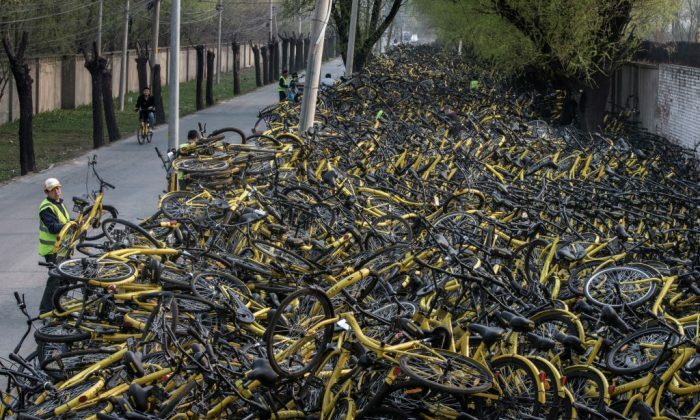 Ofo, a company that specializes in dockless bike sharing, announced changes to its corporate charter, giving the Party an actual leadership role in corporate governance, according to a June 24 article on Chinese state-run media Xinhua. The announcement was made at the company’s Party committee meeting held on June 23. Dai Wei, Ofo’s CEO, said the company’s move would allow the Party committee to provide input into the company’s major decisions. According to Xinhua, Ofo officially established its Party committee in July 2017. Since then, major decisions such as employee hiring and appointments have all gone through the committee first before implementation. Two state-run companies, Shanghai Guosheng Group, an investment company, and Guiyang Baiyun City Construction Investment Company, have also recently announced that they will incorporate the Party into their company charters. The company’s plans to streamline the Party into daily business operations garnered attention from central government officials, who were all too eager to promote an example of total Party control in the private sector. Ofo is currently competing in the U.S. bike-sharing market with its dockless bike platform. Its bikes and dockless technology can already be found in a dozen cities, including Seattle, Los Angeles, and Washington. While it is not known how Ofo’s business in the United States will be affected after its Party-first corporate charter is adopted, a recent report by the Hudson Institute, a think tank based in Washington, offered some insight into how Chinese companies operating in the United States can influence U.S. society. “Given the Party’s overriding influence on Chinese companies, the lobbying these firms do in the U.S. should be more closely scrutinized,” the report stated. Huawei, a Chinese telecoms giant and smartphone maker, is known for ties with the Chinese military, according to a July 2 report by Taiwanese newspaper DigiTimes. According to the state-run Economic Information Daily, in 2017, the Chinese regime began to push for all state-owned companies to add the leading role of the CCP to their corporate charters. In June, China’s securities regulator announced amendments to its existing governance guidelines for state-owned listed companies, with one article explicitly demanding that corporate charters be changed to include the role of the CCP.